HOW HEALTHY ARE ASIAN AMERICANS? 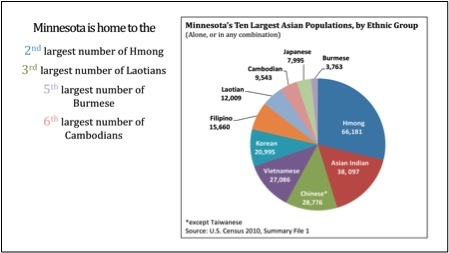 Based on the data collected from a two-year study conducted by Asian Media Access (AMA) and Asian Pacific American Community Network (APA ComMNet), the Bicultural Healthy Living Blog will be running a series of articles that examine how the eight largest Asian American communities, the Hmong, Asian Indian, Chinese, Vietnamese, Korean, Filipino, Laotian and Cambodian American communities, are faring in Minnesota. Each article will focus on one Asian ethnic community to understand the environmental, behavioral and social factors affecting the overall health and wellbeing of its members.